This is part two of the Sealants and Epoxies can be your friend series. 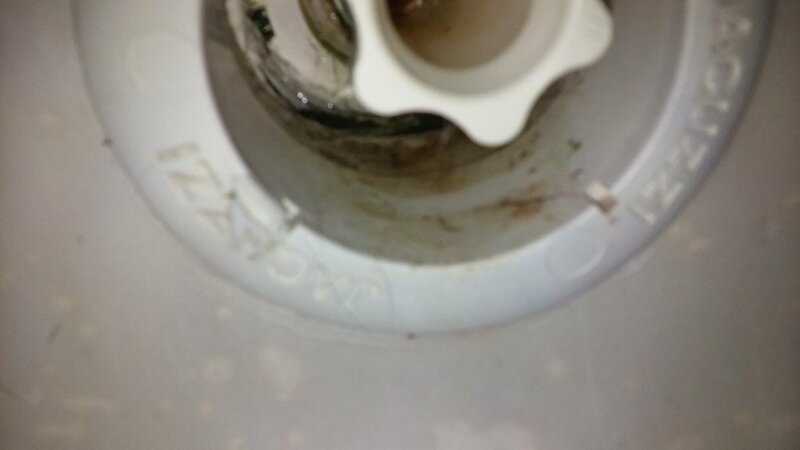 In this example of a leaking jetted bathtub, what I found was that the internal jet bodies were leaking. Additionally, it was discovered that this had been repaired in years past, and the silicone that was used was peeling off. Note these were not cracked jets, it’s just that the internal body parts were glued together and it had partly failed, leading to a very leaky tub. 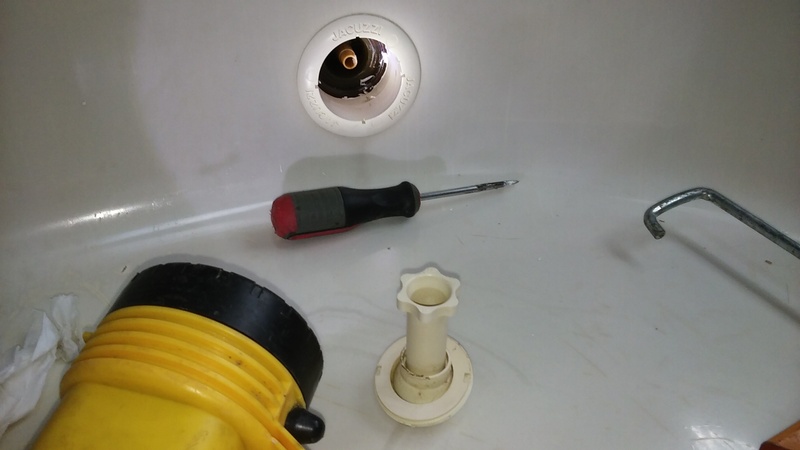 It is important to note that whenever you use a silicone in a submerged situation like this and it is applied to the surface of a leak, that periodic re-sealing of the area may be required. IE the more often the tub is used, the more frequent the replacement. That said, if silicone is used in a joint/flanged situation, as long as it has been given enough time to cure, it should last for many years. 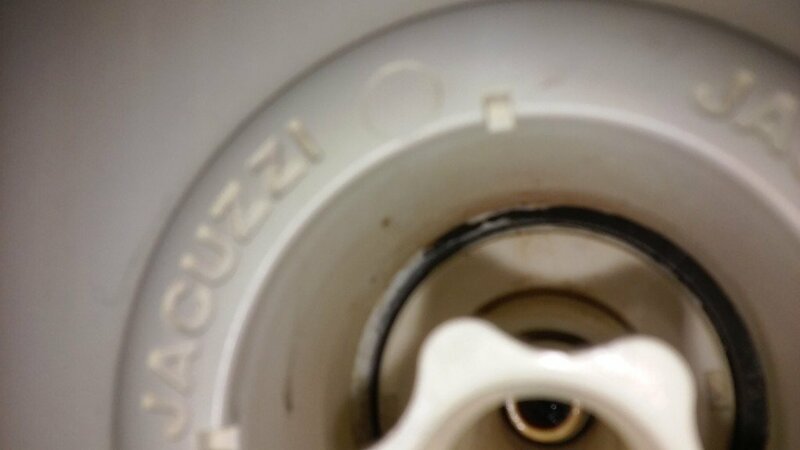 Looking closely at this Jacuzzi jet body it appears there has been some silicone applied at some time in the past and it is visible at the bottom near where the jet nozzle flange is screwed in. On another jet, I can see what appears to be some white silicone sealant in the back (between 9 and 11 o’clock in the back) of this Jacuzzi bath jet, and it’s apparent that pieces of that white silicone have come loose also; (not visible in photo). The solution is really simple – unscrew the jet nozzle, clean it out, prime it (using pvc clear primer), and add new silicone sealant. This is not difficult for the average home-owner to do. It’s quite simple. Using a screwdriver in the base of the ring that holds the nozzle, you have to ‘un-screw it. The nozzle assembly will come right out (but you may have to fight it a bit to get it to initially rotate). The above is what a Jacuzzi bathtub spa nozzle assembly looks like. 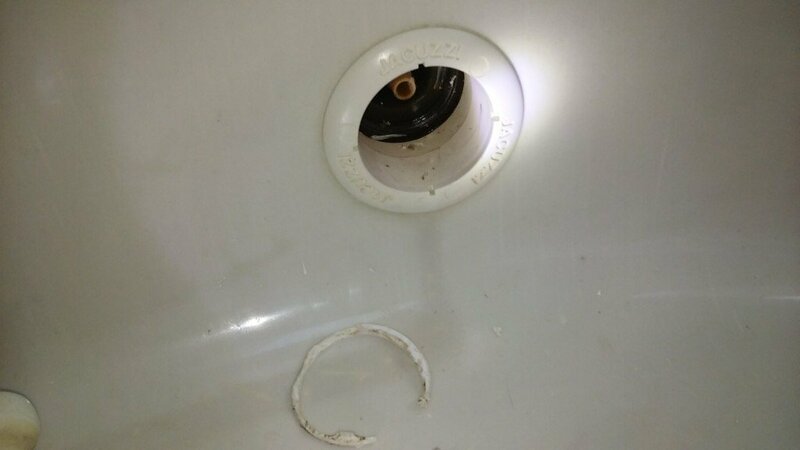 With the flashlight, you can also see where the previous silicone when it was installed – is flaking out, causing the leaks with this tub. Here’s a close-up of the Jacuzzi bath tub jet. Note the failing silicone. Another jet where the silicone came completely out of the threaded body, causing a leak. This is how I set this up for re-sealing. 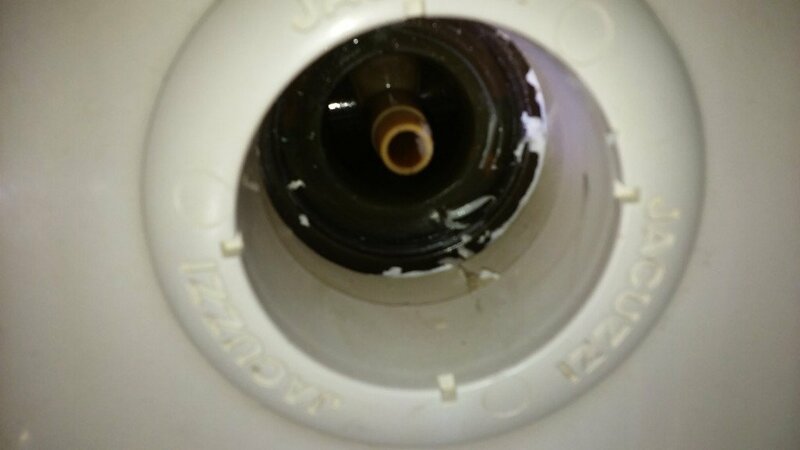 Using the dauber for clear pvc pipe cleaner, swipe the internal part of the Jacuzzi jet body and then be sure it’s dry. 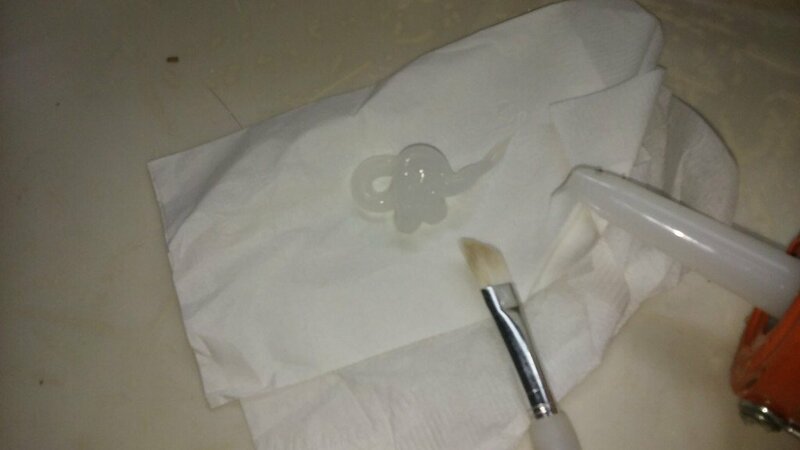 Then I put clear silicone caulk on a paper towel, and use a small paint brush to swipe it into the area where it needs to go to seal the bath-tub leak. This is actually easier said than done, because of the density of silicone, but the brush is infinitely better as an initial applicator, than the nozzle of a caulk gun – and definitely better than using your fingers. The paint brush provides accuracy and cleanliness, which is an absolute requirement when you have to do more than 1 or 2 jets. I always keep a few of these paint brushes with me because you have to throw them away when you’re finished. 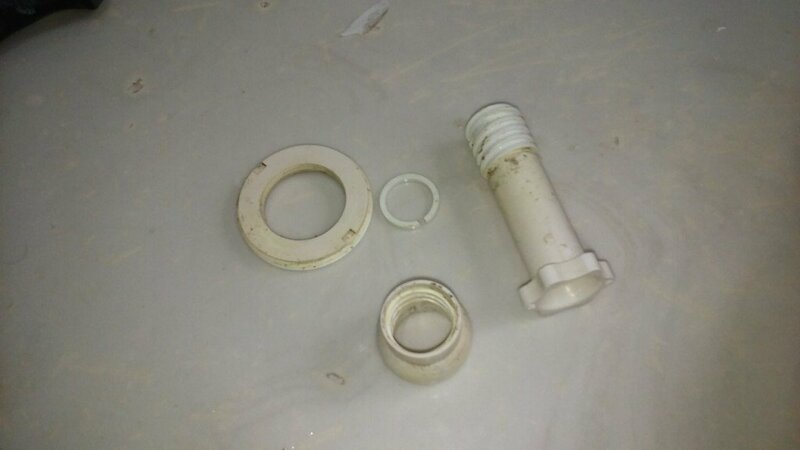 Here is what the removed Jacuzzi bath nozzle assembly looks like completely disassembled. There were no final photos taken of this job but I will say that after the silicone was place where I wanted it to go, I did use my index finger to ‘smooge-it’ in a circular fashion to cover the leaking joints completely. It works, and it’s cheap to do!